The mezzanine here is held up by these columns that you can see right there. Those are steel columns that are holding the booth up and there are more aluminum columns at the back, this one here. They all have leveling feet and then there’s this column surrounds here. These are on the ground and these are a façade that goes over the columns that are holding up the mezzanine for the 2 story trade show booths. You can see here that the columns have been extended all the way up and then in between the columns are these walls. So what you have is the mezzanine at a certain height and then you have these columns which are sitting on the floor and then these walls in between the columns. So everything has to level out just perfect, otherwise the walls will not fit here or they’ll stick up here, or it just all won’t happen because you have multiple points that are sitting on the floor. The actual structure of the mezzanine is on the floor and so is all the decoration and the facade is also sitting on the floor. You can see that all of these walls along the back here are also sitting on the floor and the walls above on the back are on top of the walls below which are sitting on the floor. But these side walls here and this backlit sign are actually suspended between the back wall and the front column. What I did was I made these side walls with leveling feet all along at the bottom here. Those leveling feet sit on the mezzanine floor. They level between this back wall and front column. We use the leveling feet to adjust in there to make sure it all fits up top properly at the two top corners. Of course in the very beginning when we set the mezzanine as you can see the aluminum column here for the mezzanine and the aluminum column here; and there’s another column inside of that facade. Those are all set at a specific height with the leveling feet set at a specific height so everything lines up when it’s all put together. Then to cover over all the joints, we put the red stripe on the outside and that red stripe covers all of the seams and the joints where everything meets up. There are also red stripes on the front which cover over the joint where the walls sit on top of the mezzanine. 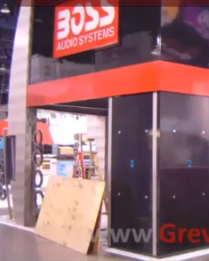 So this is one of the major challenges we overcame to come up with an excellent 2 story trade show booth design for Boss Audio Systems. 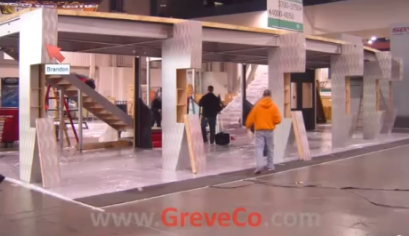 To learn more about our 2 story trade show booths Orange County and trade show booth design, visit our website at www.greveco.com.